Getting your phone via carriers can be beneficial for a number of reasons. You can get probably better exchange value for your previous phone or avail easy EMI options with bundled service plans. Some carriers do offer phone upgrade schemes where you can switch to your favorite OEM’s new flagship just after its release. The list of cons is fairly long though. Carrier branded phones often lack some global network bands and come by default SIM-locked. For users who want to tinker with their gadgets, these phones are a big no-no. Bundled bloatwares, throttled down updates, little or no official bootloader unlock are common syndromes on these devices. Unfortunately smartphone geeks occupy a tiny percentage of the whole consumers. To reach to a larger user base, companies need to advertise big, establish themselves in each and every corner of the market and do tie-ups – in this case, with cellular service providers. OnePlus did the same with the intention of penetrating USA’s smartphone market. Previously OnePlus phones were sold in US directly via official channel or third party distributors. With OnePlus 6T, OnePlus worked with T-Mobile and launched it as exclusive to the carrier. The differences between the global and T-Mobile variants are easy to spot. The carrier exclusive model lacks the second SIM and runs a special variant of magenta themed Oxygen OS with some extra pre-installed apps. If purchased through T-Mobile, the phone can’t use other networks until it is paid in full and utilized on T-Mobile network for 40 continuous days. The bootloader can only be unlocked if it is network unlocked first. As speculated, the update cycle is drastically slow compared to the global version. The T-Mobile variant got 3 updates since the launch vs. 6 updates for the global one till now. The beta channel also remains closed for the carrier exclusive model. 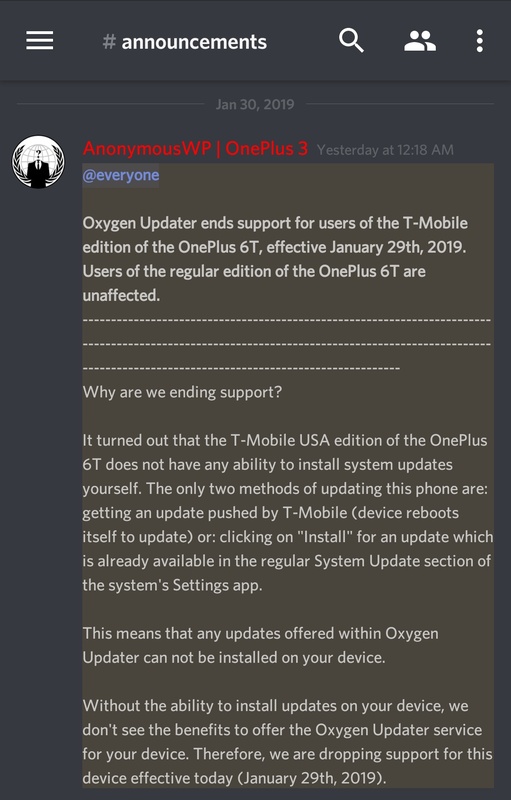 We have discussed the (intentional) delays of updates on the OnePlus 6T T-Mobile edition in another article. The firmware also seems to has some weird bugs which are not part of the global package. 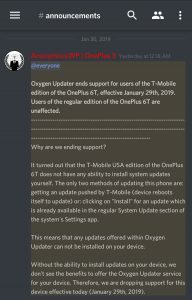 I have had a few customers come into my T-Mobile store with the T-Mobile variant OnePlus 6T indicating that the Phone application was crashing when you either open it or open it and select the Contacts tab. I was able to reproduce the issue and immediately began troubleshooting the device such as wiping the cache partition, clearing the Phone app and Contacts app cache; still no luck. What fixed the issue? I uninstalled the T-Mobile Visual Voicemail application and reinstalled it to the phone and it fixed the problem. Please note that you cannot just uninstall the VVM application, you have to reinstall it. I’m not too sure what is causing the issue itself or how they correlate with one another, but it worked. I’m sure with the update T-Mobile is pushing out soon that it will be fixed. The community tried hard to support the variant, but ultimately chose to keep it aside. 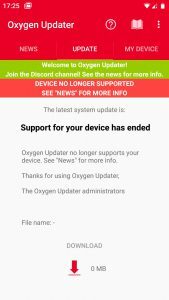 The final nail in the coffin: Oxygen Updater decided to drop support for the T-Mobile OP6T completely. There was a long discussion between the lead developer and the active members, referring the issues described in this article. Ultimately the decision had to made. Users are advised to convert their T-Mobile version to global one, if they don’t want to be the victim of the shortcomings.